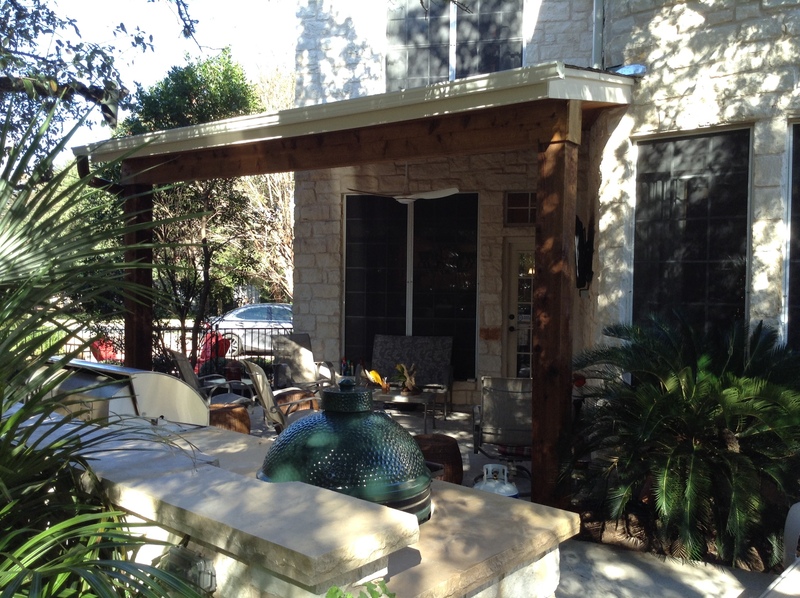 Covered porch and outdoor kitchen addition in Circle C Ranch, South Austin, TX. We hate to brag, but our newest completed project in the Circle C Ranch neighborhood in South Austin, TX, is exactly what the homeowners had in mind. Their new addition is cozy and quaint and proves that an outdoor living space addition doesn’t necessarily have to be large to be effective. This project consists of a covered porch area with a convenient outdoor grilling/smoking kitchen area that sits parallel with the covered area. The design is loaded with upscale amenities and high-quality materials in a size that is dictated by the scale of the existing home and surrounding landscape. This design is the brainchild of our talented lead designer, Jim Schallon, whom sat down with the homeowners to discuss their desires and needs in order to create a space that would increase their outdoor living enjoyment. 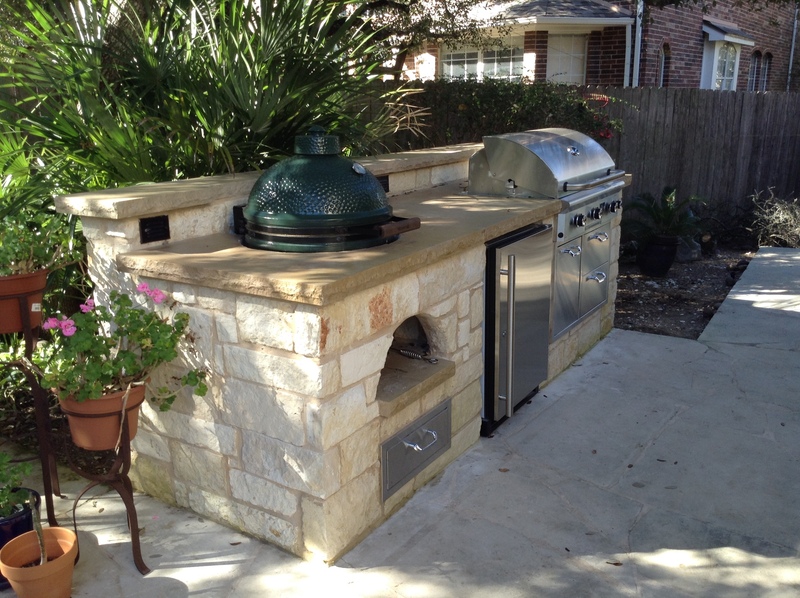 Since the clients enjoy preparing food outdoors we integrated both a grill and Big Green Egg smoker into the outdoor kitchen area, along with a warming drawer and outdoor fridge to keep everything handy. The facade of the outdoor kitchen area is covered in Limestone. The top of the area is built from beautiful Leuder’s stone and sealed for added protection against the elements, and any debris or liquids the area may encounter during food preparation. Just across from the kitchen, the covered porch offers a shady spot to enjoy outdoor dining and relaxing. The covered porch features solid Western red cedar 8×8 posts along with a Western red cedar ceiling to match. 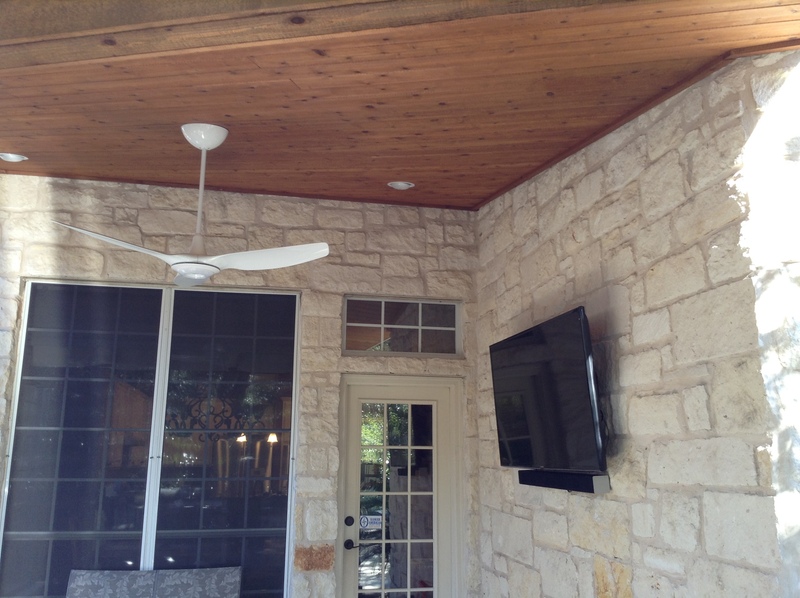 Recessed can lighting and an outdoor ceiling fan allow all the creature comforts you could ask for. Though, at first glance, this addition looks effortless to have built, the construction of the porch cover required removal of the existing stone above the porch area to make the design seamless in appearance. The structure itself is actually attached to the walls of the home to give it an “always been there” appearance. 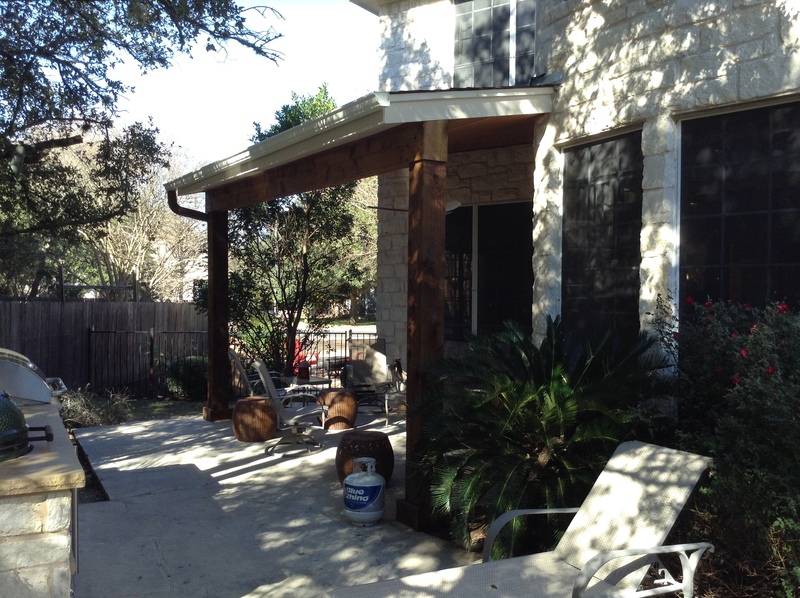 If you would like to learn more about enhancing your outdoor experience through one of our custom outdoor living space designs, contact Archadeck of Austin today at (512) 259 – 8282 or via email at jim.odom@archadeck.net. This entry was posted on January 5, 2016 by austinporchandpatio. It was filed under Archadeck of Austin, Austin outdoor kitchen, Austin patio cover, Covered porches and was tagged with Austin Covered Porch Builder, Austin outdoor kitchens, Circle C Ranch Covered Porch Builder, Circle C Ranch Outdoor Kitchen Builder, Circle C Ranch Outdoor Living Space Builder.